CAIRO, EGYPT - Egyptian authorities have launched an investigation into images said to show a naked couple who scaled the Great Pyramid that has sparked outrage in the conservative Muslim country, an official said Tuesday. In a video titled 'Climbing the Great Pyramid of Giza', Danish photographer Andreas Hvid appears to scale the 4,500-year-old tomb on the outskirts of Cairo at night with an unidentified woman who is later seen taking off her top. 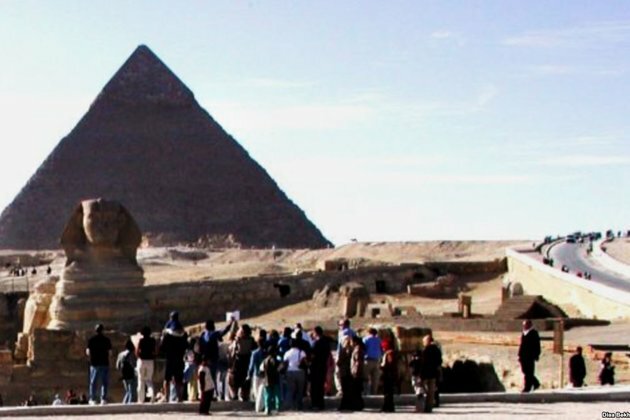 'The public prosecution is investigating the incident of the Danish photographer and the authenticity of the photos and video of him climbing the pyramid,' Mostafa Waziri, the secretary general of Egypt's supreme antiquities council, told AFP. If the video was actually filmed at the top of the pyramid, that would make it a 'very serious crime', Waziri said. 'A 7,000-year-old civilization has turned into a bed sheet,' a Twitter user in Egypt lamented. Another protested that 'they want to soil the dignity and pride of Egyptians because the pyramid reflects the glory and grandeur of the Egyptian people'. Antiquities Minister Khaled el-Enany told government newspaper Al-Ahram that the video has stirred 'anger and outrage among Egyptians', and that officials in charge of guarding the pyramids would be punished if found to have been negligent. Hvid, 23, explained back home to the Danish newspaper Ekstra Bladet that he had 'dreamed for many years of climbing the Great Pyramid' as well as of taking a naked photograph. 'I'm sad that so many people have got angry but I've also received a lot of positive responses from many Egyptians,' he said in an interview. As for the girl in the video, she was not his girlfriend. 'It was just a pose. We did not have sexual relations,' Hvid said.